There is thus the possibility that significant amounts of undigested starches pass through to the caecum or colon (large intestine or hind gut), where they are not welcome, are rapidly fermented by bacterial degradation resulting in lactic acid production, gas, heat and ammonia build up and leading to lower hindgut pH. The resulting acidic environment kills the good bacteria in the hind gut and as these bacteria die they produce endotoxins which can cause all sorts of complications in horses such as acidosis, fatigue, nervous behaviour, gastro-intestinal upsets such as colic, can lead to reduced performance and is known to be one of the major causes of laminitis in horses. The aim of feed processing is to change the physical and/or chemical form of the raw cereal starch structure resulting in greater feed availability. 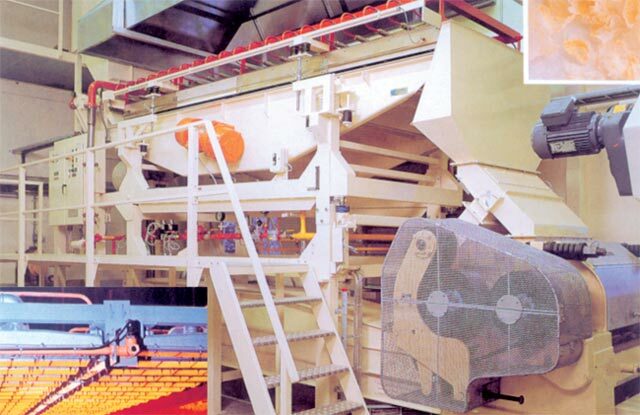 Micronization is a patented and advanced processing technique which uses the infrared wavelength as a source of energy. The micronizing process makes use of a narrow band within the infrared spectrum with a wavelength of between 1.7 and 3.4 micronization. (Please note that this is not microwave energy so the process is entirely safe). Micronizing is a relatively new technology in the equine feed industry that is set to revolutionize the way we feed horses. Micronizing is a method of processing grains using infrared technology to heat and vibrate the starch molecule followed by a rolling or flaking process. 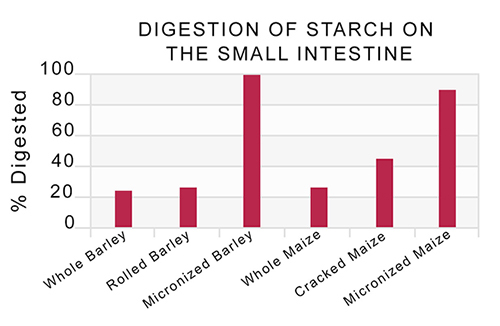 The resulting increase in gelatinisation dramatically improves digestion of barley and maize starch in the small intestine. Increased starch digestion in the small intestine promotes weight gain or growth and reduces the risk of starch overload of the hindgut. It also reduces the need to feed as much grain per meal. Micronized grains are therefore safer to feed due to better absorption and reduced risk of starch overload of the caecum which can cause colic, laminitis, acidosis or diarrhoea. Micronized grains have improved palatability after roasting so horses eat them better. In summary, Micronizing is magic! The levels of vitamins, minerals, amino acids and trace elements in all Capstone Feeds are at optimum levels to ensure proper fortification. We invite you to compare our declarations with those of other products.